It's a 3 game road trip to end the season, and the Pens will look to continue finishing out the season on a high note, as they've won 6 in a row and 12 out of 13 despite several injuries to key players that they've so far managed to overcome. They'll put that winning streak on the line when they travel to Ottawa to play the Senators. It'll be a long offseason for Canada, as all 7 Canadian teams have been eliminated from the postseason, making it the first time since 1970 that a field of only American teams would chase the Stanley Cup. But while they won't be making the playoffs, it'll be important that the Pens don't overlook the Senators with games against the Capitals and Flyers looming, as they'll need to keep winning to secure 2nd place in the Metro and home ice advantage in the first round of the playoffs. 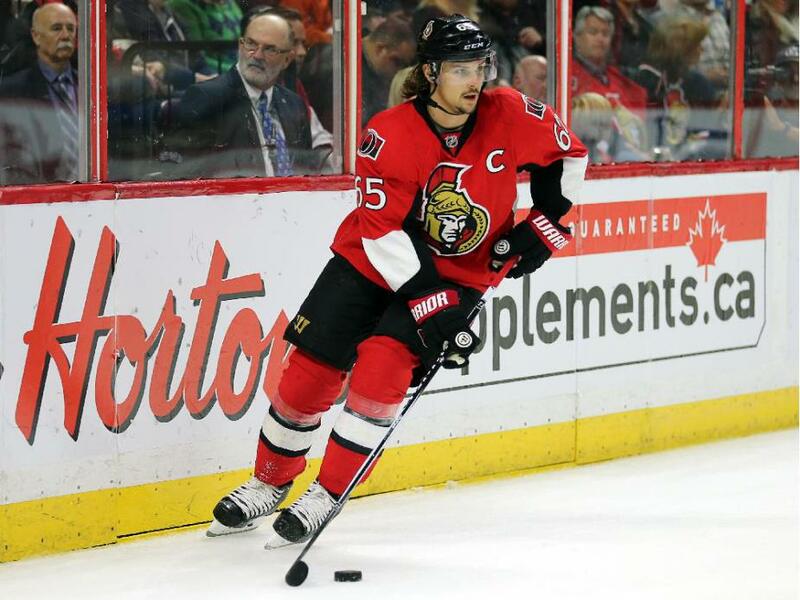 Erik Karlsson has put together a season that has made him the Norris Trophy front runner heading into the offseason. The Ottawa blueliner is having one of the best scoring season from a defenseman in the post lockout seasons, and he sits 4th in the league with 79 points. With 79 games played, Karlsson currently has a 1.00 points per game average, and if he maintains that over the next 3 games he would be just the 4th defenseman to top a point per game average since the 2004-05 lockout, and more impressively he'd do it at a time when scoring rates have plummeted league wide. While Karlsson is a strong driver of offense from the blueline, it's a couple of surprising players who have managed to lead the team in scoring from the forward position. Mark Stone and Mike Hoffman were relative unknowns before last season, but they've come in and established themselves as offensive forces in the league despite more veteran and higher priced options in Ottawa. Mark Stone was the 2nd leading scorer for the Senators last season, just two points behind Karlsson, and he finds himself in the same spot on the team leaderboard this year. Drafted in the 6th round of the 2010 NHL draft, Stone came out of nowhere to earn a spot as a Calder Trophy finalist last year with 26 goals and 38 assists, and he's backed up that strong play in his sophomore campaign with 61 points on the year. Mike Hoffman was a 5th round pick in 2009, but like Stone he's also made a big mark during his time with the Senators. After scoring 27 goals and 21 assists last season, Hoffman has already bested those personal bests with 28 goals and 28 assists through 75 games played this year. While the offensive has been performing well in Ottawa, ranking 9th in the league with 2.76 goals per game, it's been the defense that has doomed them to an early tee time, as they've allowed 2.96 goals per game. A big part of the reason why has been their struggles in net. Both Craig Anderson (0.915 SV%, 2.81 GAA) and Andrew Hammond (0.913 SV%, 2.66 GAA) have been largely mediocre on the season. For Anderson, it continues a largely inconsistent career where he can look poised to enter the conversation of elite netminders one minute before looking well below average the next. The poor season is more expected from Hammond, who was having a poor year in the AHL last season before being unstoppable down the stretch for the Senators. The team gave him a 3 year deal with a $1.35 million AAV despite having all the hallmarks of being a flash in the pan, and the signing led them to trade away Robin Lehner in the offseason, who has outplayed both Ottawa goaltenders when healthy this year. - Matt Murray has been named the NHL's 3rd Star of the week for his performance this weekend against the Islanders and Flyers. In the back-to-back games, stopped 52 of 54 shots faced (0.963 SV%) with one shutout while allowing 2 goals (1.00 GAA). - Sidney Crosby has been named the team's MVP, the sixth time that he's earned that honor in his career. The Penguins had also announced the other team award winners in the lead up to the season finale Sunday.